A few years ago, we stumbled across a general meetings book during a factory clear-up. 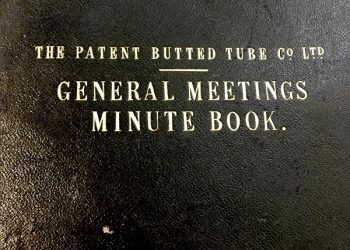 But this wasn’t just any old meetings book – this was a part of cycling history, Reynolds’ record of the company’s very first meetings, from the Patent Butted Tube Co. Ltd’s date of incorporation on December 20th, 1898. We’ve taken the general meetings minute book to a few shows, but being well over a century old, we’re careful about taking it travelling too often. So here’s a look inside at the first two pages, which record Reynolds’ incorporation in December 1898 and our first ever general meeting in Birmingham, in March 1899. The First Ordinary General (or Statutory) Meeting of the company was held at the registered Offices of the Company, 178 Newton Road, Birmingham on Monday 27th of March 1899. The … /… the Meeting having been read, the Solicitors to the Company reported, That the Company was duly registered on the 20th day of December last. That the Sale of purchase Agreement had been duly stamped & filed, as required by the Companies Acts. That the … of Mr A.M. Reynolds & Mr J.T. Hewitt in the Letters patent No. 24931 of 1897 had been assigned to the company. That one fully paid Ordinary share of £1 had been allotted to each of the seven signatories of the Memo: & Articles of Association. That in accordance with the … of the late Purchase Agreement 1800 fully paid Ordinary Shares of £1 each had been allocated to Mr A.J. Reynolds and 500 fully paid Ordinary Shares of £1 each had been allocated to Mr A.M. Reynolds. 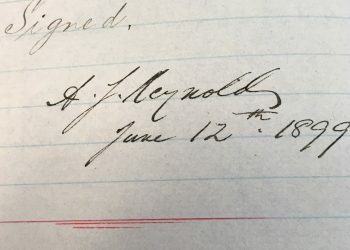 And That in accordance with the terms of the Assignment of the patent, 500 fully paid Ordinary Shares of £1 each had been allocated to Mr A.M. Reynolds and a like number to Mr J.T. Hewitt. You can find out more about the innovative tube butting process, which A.M Reynolds and and J.T Hewitt patented in 1897, here.